Low battery life on the go will be a thing of the past with this promotional item. The USB utility charge tool is a brilliant little gadget which resembles a Swiss army knife features a host of foldable cables to charge any of your electronic items. 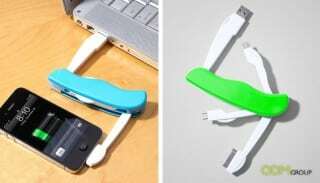 The perfect travel and daily use item can connect to a computer USB port to charge your iPhone, Android phone, MP3 player and other gadgets. It’s compact design means that it can easily fit in your pocket or be tucked away when travelling. There are great qualities and aspects that help the USB utility charge tool stand out as a promotional gift. Its function is one that just about everyone has a need for as most people use portable electronic gadgets. It is suitable for both men and women to use it. Alternatively, it can easily be differentiated into a male or female item simply by choosing a feminine or masculine colour for the product. The plastic case provides a good surface for branding. Producing this item in large quantities will create economies of scale. This will create a good return on marketing investment.